Moments of Mommyhood: We Have A Winner! Thank you to everyone who entered my giveaway for Fishful Thinking! I really believe that Fishful Thinking is a great resource for all parents! Teaching our children to be strong and handle what life throws at them is very important and Fishful Thinking can help do that! So, this morning I randomly picked a winner for the $25 Target gift card! 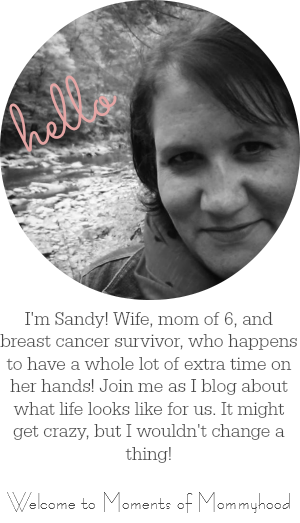 It's Vickie from Vickie's Scrapbooking and Tidbits! Congrats Vickie! Just send me your mailing info and I'll get that out to you! Woo Hoo!! Thanks again Sandy! My husband and I are geeked! Thanks for visiting my blog from SITSta's...it is so nice to find someones blog that has "older" children...Iwill have to follow your blog and maybe gets some tips on raising a teenager...mine turns 13 in July...YIKES!!!!!! Great Blog too! Looks like I missed your giveaway! Thanks for stopping by my blog and the kind words. I am excited to be part of the SITS and looking forward to meeting more interesting people like you. Princess Lucy is so cute!